Something different from the usual fare on this blog to start off the week. 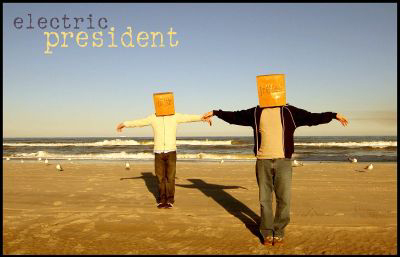 I stumbled across Electric President only recently; actually when I was introduced to the band, Radical Face. Electric President is the side-project for Radical Face’s frontman, Ben Cooper, and Alex Kane. While this track was originally released in 2006 (I know, slow pick up much?) on the self-titled album, it still remains an exciting tune. Somewhat part Postal Service, some parts Myslovitz, Ben Cooper has an intriguing, plaintive voice that demands you listen with a whisper. While the electronic touches may not be for everyone – again, think Postal Service – it’s well-worth a listen. For more songs, check out their official page on the Radical Face site. In the meantime, however, here’s Insomnia by Electric President for your aural pleasure.